Luke O’Brien is one of the very best Tasmanian landscape photographers. 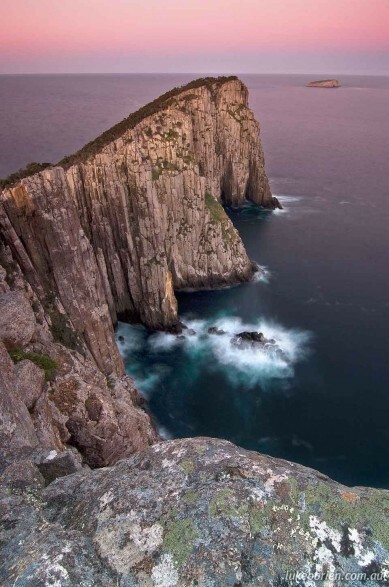 This is one of his images of Cape Hauy, Tasman Peninsula, one of the three southeast capes of Tasmania that we rounded last week when Adagio sailed back to Tassie. Check out Luke’s work at www.lukeobrien.com.au — it’s really easy to order prints! In visually comparing one quality level to another, it’s very helpful to swap back and forth quickly between the two samples, as it hyper-highlights differences, revealing details of the difference that one would never otherwise notice. While this is useful, it’s important to maintain a sense of perspective about what viewers will eventually see and actually notice on their own. Don’t let yourself get carried away by raw pixel-peeping alone. Comparing adjacent quality levels — Comparing adjacent quality levels is as simple as panning the mouse back and forth between the adjacent quality buttons. Comparing a quality level versus perfect — Bringing the mouse just below a button reverts the display to the “lossless” perfect-quality version, so sweeping the mouse up and down into the button then below it toggles between the view for that button and the perfect-quality version. Comparing any two quality levels — Selecting the small circular checkbox below a quality button makes that button the one reverted to when the mouse is brought under a button, so you can select the checkbox for one quality, then move to the button for the other and pan up and down to toggle between the views. Read more » I can almost guarantee you will be surprised and rewarded. NOTE: Jeff is developing (may have already released) a Lightroom plug-in similar to what you see on the linked web page. So you can evaluate the appropriate JPEG compression for your own specific images. Utah photographer Jeff McGrath recently published a remarkable lightning capture: A lightning bolt touches down on the South West side of the Prison at Point of the Mountain in Utah. Jeff is a software guy, showing a real talent for photography. If you haven’t seen Mikes photos you need to get straight over there. And for sure enjoy Mikes “7000 fps” video. Mike is a brilliant UI designer and innovator who happens to also do photography. Why do we make home videos? “The unexamined life is not worth living,” said Socrates. And what I’ve learned from my video-transfer project is this: You can’t examine your life if you can’t remember it. We’ve been through multiple generations of sunset movie tech — from 16mm film to 8mm video to Hi-8 to MiniDV. Each transition orphans the earlier content — absent a lot of work and money to convert formats. Now MiniDV is dead, so our library (in storage, no room on the boat) of LOTS of content will be orphaned just like our library of Hi-8. I think you will find the answer isn’t as obvious as you might think. Bottom line is that I think David is correct in his view that where the line is depends on the application and context. E.g., compositing is OK for advertising, but definitely not OK for new photography. A photography competition is another set of values — where I would say absolutely no compositing, unless it is a special category for such digital products. I think you will find the way David lays out a progression from “raw image” to “3D modeling” a useful prod to your own thinking. Here are three more from Digital Photography Experience. These folks continue to produce concise well-written “how to” articles. There is also a DPE audio podcast – check it out.